Monroe Gas Storage Company is a depleted reservoir natural gas storage facility operating in Monroe County, MS., near the town of Amory. 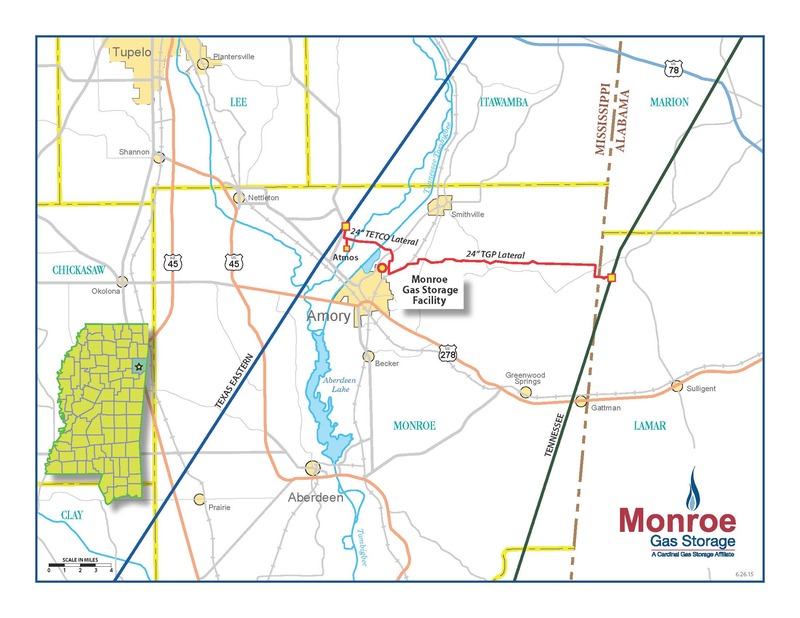 Monroe currently has approximately 6.7 million Dth of working gas storage capacity in commercial operation. The facility has three interconnect which include: TGP's 500 Leg, TETCO Zone M-1 30 and Atmos. Monroe is a FERC 7(c) certificate facility and offers a range of services including firm storage, interruptible storage, wheeling, and PALs. Links can be found below to the Monroe tariff and service forms. For more information, please contact us. ©2017 Cardinal Gas Storage Partners. All rights reserved.